The financial bailout plan got scrapped. This “rescue package” failed and the stock market didn’t like it. 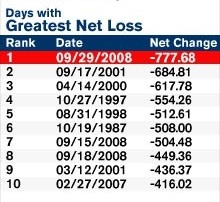 I won’t lie — what happened in late September, 2009 to the stock market has made me nauseous, and no, it’s not just because I’m trying to recover from a nasty flu bug. 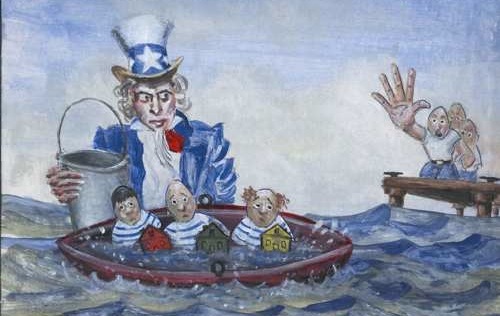 The stock market is being fueled by fear at the moment, sparked by the failure of our government’s “rescue package” for troubled financial institutions. The market’s behavior tells me that investors want the bailout to pass. And in the absence of any approved fiscal solution, we instead get the worst point drop for the Dow Jones index in its history. 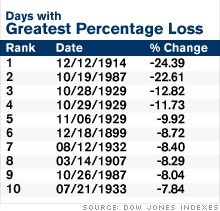 Note of course, that the absolute point drop here is only around 7%, and does not qualify as one of the worst days in terms of percentage loss. Seeing that the market is unhappy about this turn of events, you may wonder why the overall consensus here by the investing public is for the bailout to pass. I’d say it’s because the market wants resolution of some sort and would like to move on from the uncertainty brought about by debate and wrangling in Congress. The public wants the ongoing drama to be over and believe this artificial solution is the ticket. The dire warnings of some of our political leaders — about how the financial contagion going on unchecked could raise the potential for a terrible recession (and us hurtling towards the next Great Depression) — may have riled up the markets sufficiently. And I’m sure the media coverage and hype help quite a bit too. Protecting the banking system, which is fundamentally controlled by the Federal Reserve, is an established government function. It is completely unclear why the government needs to or should bailout insurance companies, investment banks, hedge funds and foreign companies. The bailout will help quiet the global financial system and markets. It will instill confidence in investors. Even Warren Buffett is for the bailout. It may help circumvent the threat of recession. It will prevent job losses, especially in downed institutions. It will keep liquidity in the markets. Bank assets bought by the $700 billion bailout may be worth more in the future. The bailout can be pretty costly to taxpayers, if bought assets don’t recover. It can cause the budget deficit to balloon as the bailout will mean more government borrowing. Who knows what the true bailout will cost when the plan is finally executed. Bank and financial company leaders will get away with their mistakes. No lessons learned. Do we want more government intervention? The state may obtain a stake in bailed out firms. I won’t be the first nor the last financial blogger to review these matters, but for what it’s worth, here’s my .02 on this: I’m not sure I buy into the ongoing fear-mongering we’re being subjected to at this time. I’m also one of those who’s fine with letting the cards fall where they will, even if it means working out the pain in the near term (though many folks would prefer anything to arrest their pain right now). I believe the bailout is expensive, and yet comes with no guarantees; worst of all, it sends the message that there’s no accountability among the higher ups. I’m all for bailing out of the bailout and letting the financial industry find its own footing out of this quagmire. So how about you? How do you feel about this failed rescue package? My primary concern about the rescue package is that if passed, it will serve as cover for those who are complicit with Wall Street in this disaster: consumers who became addicted to credit and Congress for insisting that Fannie/Freddie/banks continue to lend money to people who had no business buying a home. Barney Frank is probably the biggest hypocrite in all of this. My concern if the rescue package is not passed is that a lot of readers will be receiving pink slips for Christmas. I like the analysis. I think the bailout was more of restoring confidence in the markets, rather than to save the markets. So I would vote yes for the bailout. Though it is only a small step in the longer term review of our financial industry that got us to this point. Tender spot hurting a lot? Other side too? Bruises on your face and body throbbing? Poor little America. Our heart-felt prayers from Canada go out to you! It’s either what you said about the investors wanting it behind them or may be that they are focusing on the headlines of “Congress Fails…” Failure is hardly a vote of confidence, though in this case, I’m pretty excited how things went. It’s just another buying opportunity right? Apple around was around 105. Google was under 385. Good time to get into Silicon Valley, eh? I realize it is much more complicated than this, but I think the plan will not provide a long term solution. It seems that it will put the financial problems out of sight and out of mind temporarily, until after the election? ?, but we will have to face the problems eventually. Why do I feel this is just the beginning? A few people I know insist that we’ve got a long 2 years ahead of us as the markets (real estate and equity) go through a “health-restoring” period. It is so scary! I really hope the things get better! I am pretty steamed that Congress rejected the bill. What partisanship! Throw them all out! But for now, I just keep dumping money into my 401k! Gotta grab those deals for sure…it can’t go down forever. I strongly disagree. The markets have tried to find a way out for months now, and apparently they keep failing. That is why a bailout is needed. They can’t fix it on their own, and the Fed is running out of options (and money too!). The one thing I learned, as a professional trader and manager, is that the markets are always right. The markets are falling apart for the attention of getting a bailout. Besides, the potential cost of the decreasing short term stock market value is much greater than the long term cost for $700 million. Sure, more debt causing our dollar to plummet, but that is a long term problem. We need a short term solution, like a bailout, to fix the ailments of system. Saw a commentary this morning that gave this view point: The bail out might help but it would be temporary and the long term effects would be bad – devaluing the dollar and bringing on a real depression. If the market is allowed to go through a natural correction, it will be painful for about a year or so but better in the long run. Are we the “immediate gratification generation?” Doesn’t it take faith to stand back and let the economy do what it naturally does? Kind of an organic view point. Scary but I see it. 1. It’s an open-ended giveaway to banks. There is no equity position or accountability for taxpayers. If the banks recover they alone benefit. And if they falter, we will have to pay even more. Housing isn’t going to recover for another two years, so this could cost us a couple of Trillion. 2. We don’t have the money to give. Our Government is already 9 Trillion dollars in debt and it is negatively affecting many aspects of our lives. We don’t have a spare Trillion laying around any where. 3. It’s Deja Vu all over again. We have already seen this with the S&L crisis of the ’80s and the RTC fiasco of the 90s. Banks will never become responsible as long as we keep bailing them out. We will be doing this again in the next economic cycle, if we do this now. 4. I don’t believe the banking system will fail. Despite all of the scare-mongering, most banks will find a way suvive in business, without a bailout. When a bailout isn’t possible, the strong banks will buy up the week banks and life will go on. I think many readers don’t have a clear understanding what the fuss is about, hence a lot of “addicted to credit” and “let bad banks fail” messages. Wake up. This is not just about “a few bad banks’ failing”. The crisis is about a frozen world credit markets with banks afraid to loan money to each other and to businesses, and this is the worst its being since 1929. Where do you think banks keep your deposits? In a vault earning 0% while they pay you 5%? They couldn’t survive if they did it, right? So the money are invested in for example loans. When too many people come to withdraw their deposits, banks take short-term loans from other banks then repay the loan when they get income. This panic caused runs on banks, so even good banks may have difficulty paying the depositors. If banks cannot meet their obligation they fail regardless of how much money they may have in assets – they cannot sell assets quickly enough. Businesses need loans too. A shipping company gets paid when they deliver goods, but they need to pay their crew first. A construction company gets paid when they build something, but they often have upfront expenses. Your employer doesn’t keep payroll money in a checking account either. It keeps money invested in the business, when it needs the money e.g. for your paychecks, it sometimes borrows money short term at low interest, pays your salary then repays the loans. Sometimes the timing when your company gets money is delayed. Again, it needs short-term low interest loans to cover, then repays. This process happens all the time. The frozen credit markets don’t just hurt “bad banks”. They hurt smaller banks when they have difficulty getting loans, then have to pay 4% instead of normal 2%. It hurts whole industries like world-wide shipping (there was an article in Guardian about ships being stranded in Greece because a company couldn’t get loans to pay their crew). It has potential to hurt a lot of smaller businesses that have nothing to do with banking. If this credit freeze continues a lot of businesses will have difficulty getting credit and may fail or at least layoff people. When people are laid off they don’t buy much, it doesn’t help the economy. On a personal level, it’ll be difficult if not impossible to get mortgages, so real estate can fall further. Only the rich will be able to go to colleges because nobody will be able to get student loans. Credit is important and it is not just about credit cards. This is the goal of the bailout – to unfreeze the credit markets before this situation spreads and becomes as bad as 1929. As to the money – how much billions do you think it will cost if this crisis spreads and causes massive unemployment? How many people have already lost their jobs? What about fed injecting liquidity into the system, where do you think this money comes from? What about FDIC money – sure they have some reserves from what banks are paying them, but what happens if many more banks fail? It will still cost us money and unless something is done, it may indeed get really ugly. Well, there was no bailout of the investors in 1929. Did it help? Who exactly are you going to teach a lesson? Executives who got us into this mess; I’d bet they can retire now on their millions. Regular bank employees like IT and tellers who are now unemployed? The IMF, World Bank and many big shots from the US preached that countries should never bail out companies, when we had that big mess known as the Asian Financial Crisis back in 1998. Wonder if any of those guys are still around? And if they are for this mother of all bailouts? I don’t totally agree with helping out failed banks and their risk-taking traders but there is simply no other option. The people who are aginst the bailout forget that this could directly impact upon them because it will affect their pension funds and their future job security if the bill does not go through and the economy worsens. I understand both sides of this discussion, but to me there seems to be a huge missing piece. Does anyone remember the DotCom Boom? Especially in the Bay Area, but all over the country, a lot of people were making big money at companies doing hardly anything. I had a very well paying internship where I worked 20 hours a week and spent an embarrassing amount of time basically doing nothing. Everyone was making lots of money and buying into the housing market. Real Estate became extremely inflated. Most middle class families had to travel really far outside of business centers in order to find a house that they could afford (or more house than what they could buy closer in). I graduated college about the time of the bust. That was 7 years ago. It’s been just the past couple years that housing prices have started to drop, due to the fact that some people can’t afford their mortgages. A lot of people want to place blame on home buyers, but in a lot of markets the only way to afford a house was to buy more house than one could typically afford. Sure, you could just not buy a house. I didn’t, my finances are in good shape. But it is drilled into our society that home ownership is super-important. At the founding of our country you had to be a property owner in order to vote! So…. my feeling is that this bailout, while important in a global market and other ways, will do nothing to really “reset” the market. My husband and I still can’t afford something traditionally considered a starter home in our city. And I’m not in San Francisco or New York City… I’m in Portland, Maine! Everyone keeps talking about how foreclosures cause all the other houses in the neighborhood to lose value. Guess what, this is what we call “resetting the market”. My husband is a middle school teacher, I have an office job, and our salaries are the same. We aren’t starving artists. But we can’t afford the 950 sq. ft. 2 bedroom ranch for sale down the street from us! Please please please don’t tell me this house is priced appropriately, because we make way more than what would qualify for low-income housing assistance. It’s not just about the house. The house may be priced competitively for the neighborhood, but doesn’t anyone see that the whole neighborhood is over-priced? And furthermore, my grandparents’ generation were of the mind that you invested in a house as a place to live, not as a money-maker. How many people do you know have a house they own free-and-clear? The mindset has changed, and this bailout does nothing to get us back to that mindset. I agree with the comment that said, it bails out the wrong people! its’ so true, it puts more money into their hands when they are not the ones really suffering!!! nice blog but as far as i am concern bailout is a wrong culture, bail out may not be a solution for all the companies.